Also, the luck of the draw is high, and you have no fellow Spirits to compensate for your Spirit's weaknesses and limitations. 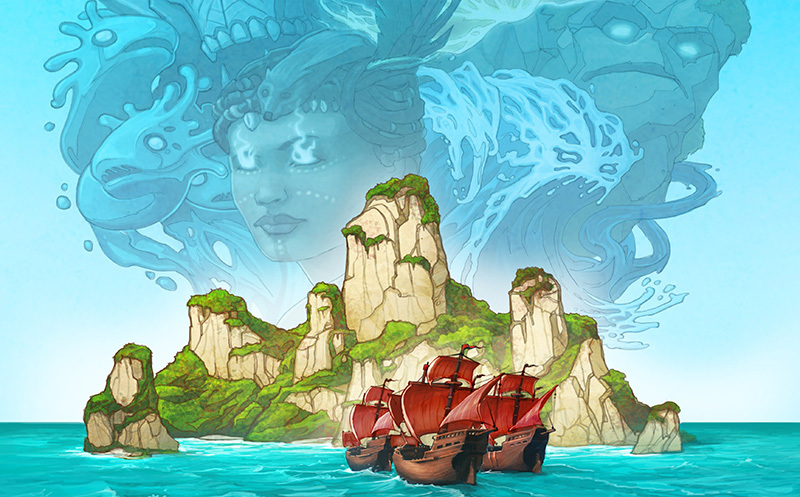 Adversaries are specific colonizing Powers from the world of Spirit Island. 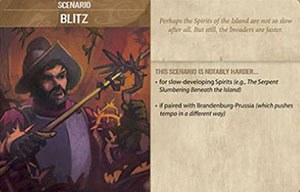 Including an Adversary in a game is optional, but doing so adds an additional layer of depth and strategy to the game. Be sure to choose your foe before Setup begins, as some may change the rules of Setup. 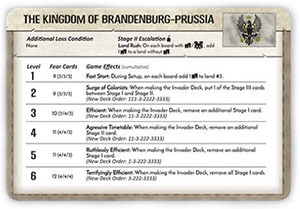 The Adversary Panel specifies an Escalation effect, which is performed when the is reveled on Stage II Invader Cards. Some Adversaries also include additional loss conditions. These two rules are the base level' of an Adversary, providing a small difficulty boost. From there, each Adversary offers multiple increased difficulty levels, indicated by the number on the left. All listed game effects are cumulative: if you're fighting vs. Level 3, you also use the effects from Level 1 and Level 2. Some Adversaries modify the Invader Actions. There are Reminder Tiles to put below the Invader Action spaces on the Invader Board to remind you that the rules for those Actions are modified. As the difficulty increases, reaching higher Terror Levels becomes harder. Each Level shows how many Fear Cards to use and how many cards go in the top/middle/bottom of the Fear Deck. Excellent first adversary with few new rules; most of the changes occur during game Setup. Speed is the name of the game: the Invaders do everything at a faster tempo. Cards with 2 land types come up much earlier, often before the Spirits have had time to prepare. Buildings, buildings, and more buildings - England sends so many immigrants that the colonies spill over into unexplored lands. It doesn't start out fast, but constantly pushes its borders forward. They will push hard to found a capital during Stage II. England is notably easier for Spirits good at wrecking Towns (e.g. Lightning s Swift Strike). Sweden's Ravages are more dangerous than most, with advanced military tactics and a large population interested in farming and mining. The Crown's policies favor assimilating the Dahan where possible, though these efforts will only work where Invader population is large. This Adversary is notably easier for Spirits which can prevent Ravages (e.g. A Spread of Rampant Green or Vital Strength of the Earth). 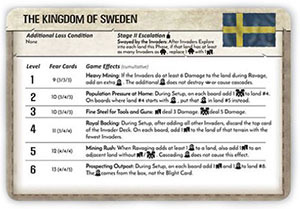 A Note Regarding Setup: The Kingdom of Sweden can add Blight during Setup. Blight added during Setup does not cascade or destroy Spirit Presence. Scenarios change the situation the Spirits find themselves in, or the capabilities of the Spirits. 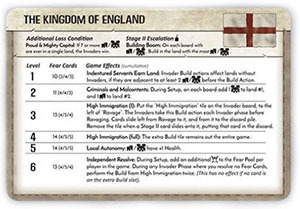 They may involve different victory conditions or additional prerequisites for the standard victory condition, in addition to other rules changes. All Scenarios have a number in the upper-right corner that denotes their difficulty rating on a scale from 0 (no change) -10 (insanely difficult). Playing with Scenarios is optional. You may play a game with an Adversary and a Scenario or just using one or the other. If rules changes from a Scenario and an Adversary contradict each other, the Scenario takes precedence. The thematic boards are intended for experienced players, both because finding terrains at a glance is harder with the more realistic art style, and because some of the changes make the game more difficult: more lands per board, clustered terrains, more starting Invaders, etc. The reverse side of each island board shows an alternate map. These maps represent the canonical Spirit Island, and prioritize theme more highly than the front balanced sides: land types cluster together, wet terrains tend to be on the windward side of mountains, etc. 2 players: Use West and East, touching on the side opposite the Ocean. 3 players: Use West and East as above, plus Northeast above East. 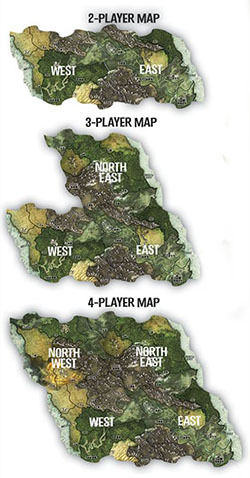 4 players: Use West, East, Northwest, and Northeast in the usual four player layout. Some lands have Setup icons for tokens from the Branch & Claw expansion; ignore them when playing with just the core game. Illustrations of Spirits, rivers, and wildfires are for flavor and do not alter gameplay. Some lands overlap slightly onto other boards . A land is always considered to be on the board where its land number and in play. Victory: Score 5x Difficulty, +10 bonus for winning, +2 per Invader Card remaining in the deck. Defeat: Score 2x Difficulty, +1 per Invader Card not in the deck (both in the discard and face-up under Invader Actions). Victory or Defeat: +1 per X living Dahan and -1 per X Blight on the island, where X is the number of players in the game.